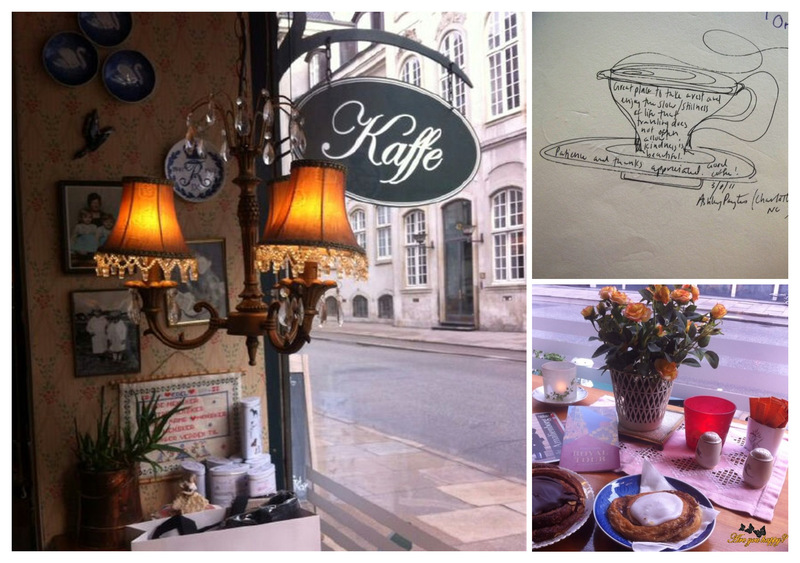 Our favourite spot in Copenhagen is definitely Mormors cafe which translates to “Grandma”. It’s a cosy little café with tables inside and outside and usual window stalls that you can find in most of Copenhagen cafes. The décor is a special one reminding you of a dream living room of anyone’s grandma, a place where you can find ancient furniture and old time memories, porcelain, old pictures, not matching chairs. The staff is really nice and welcoming. They serve homemade sandwiches and Danish cookies, smoothies or all sorts, coffee and amazing warm chocolate to take the edge of any day. They even have two memories book where visitors have signed in from 2008 onwards; take time to read through them we promise it will be a fun ride. Giest is a very fancy restaurant in Nyhavn area and rather expensive one. It has a simplistic décor, with diffuse light and candles and with everything just in the right place that you instantly fall in love with the atmosphere. The kitchen area is open so you can see the cooks preparing meals. The star and owner of the restaurant is the cook Bo Bech and the menu includes items like baked celeriac with condensed buttermilk, guail with chanterelles and chili, salted and dried young duck breast; the guy won a Michelin star in his fomer restaurant Paustian. 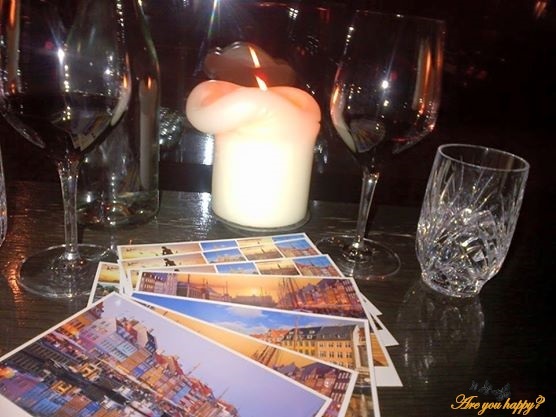 We enjoyed some wine at the window stalls, at candlelight overlooking the Nyhavn area and Geist definitely goes on our list for the next visit when we promise to try some of Bo Bech specialities. 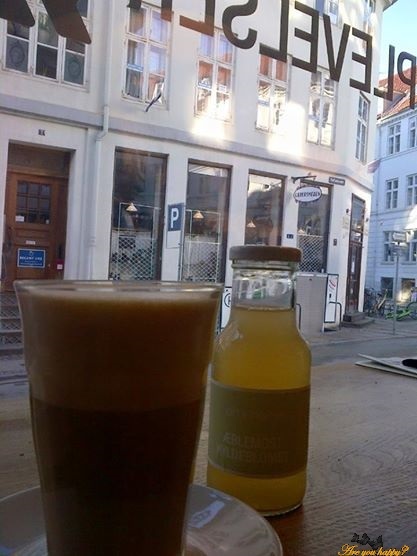 Located in the Nyhavn area, good restaurant serving also breakfast and brunch for a fixed price (99DKK). The staff is really nice and the food is amazing. Located in the centre of Copenhagen on 2 floors it’s the perfect gateway from the city. It was incredibly crowded with locals enjoying dinner and drinks. We tried their Danish beer and their amazing chocolate cake. 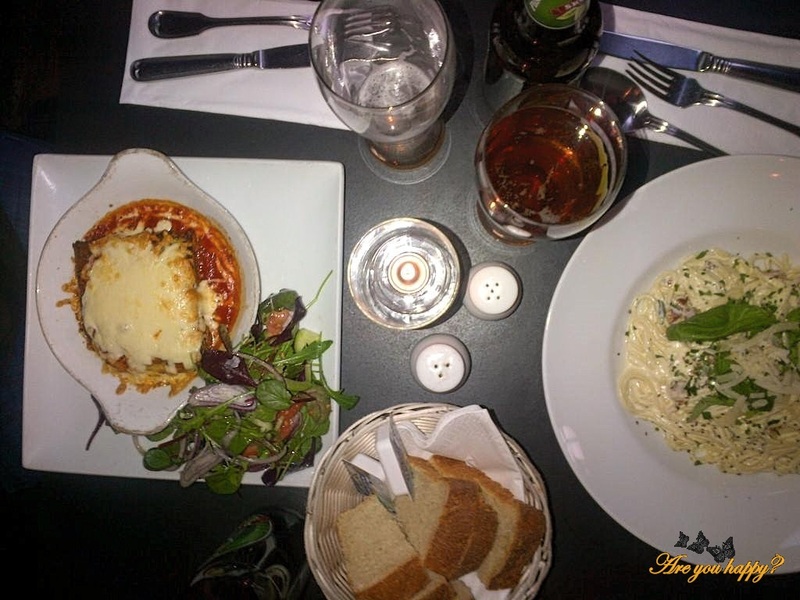 Located near the Round Tower this is a spacious restaurant more than a café like the name indicates. It serves buffet dinner and lunch and it was thus crowded. We had late lunch for half price with pastas and Danish beer and all was very tasty. Prices are also very affordable. Fancy restaurant that seems to have also some live bands in certain evenings. 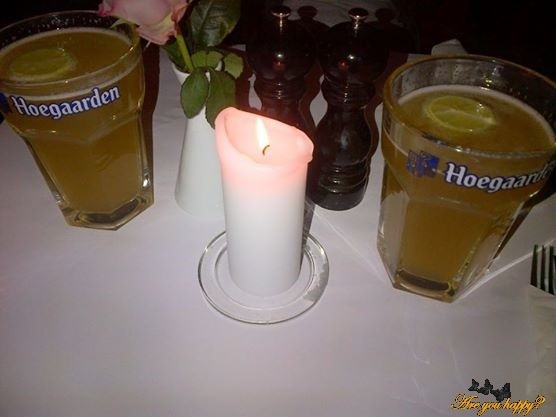 We loved their steak and fries all together with some Hoegaarden beer. Organic bakery and coffee, light and elegant decor, the usual window stalls and a couple of tables and couches. They serve great coffee, juices and cookies. “You can kill ten of my men for every one I kill of yours, but even at those odds, you will lose and I will win”. This is what Ho Chi Minh was saying to the French in the late 1940s. 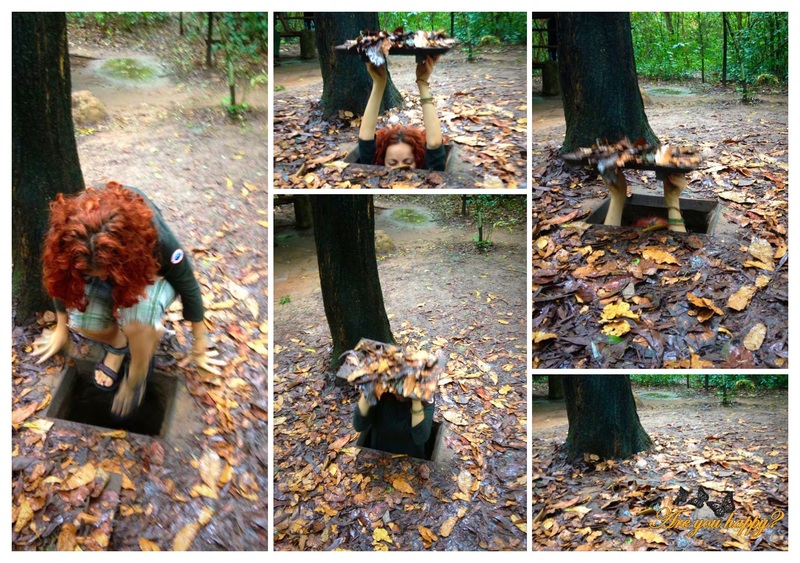 It was our first day in Ho Chi Minh City (better known to us as Saigon) and we were off to visit the Cu Chi Tunnels. 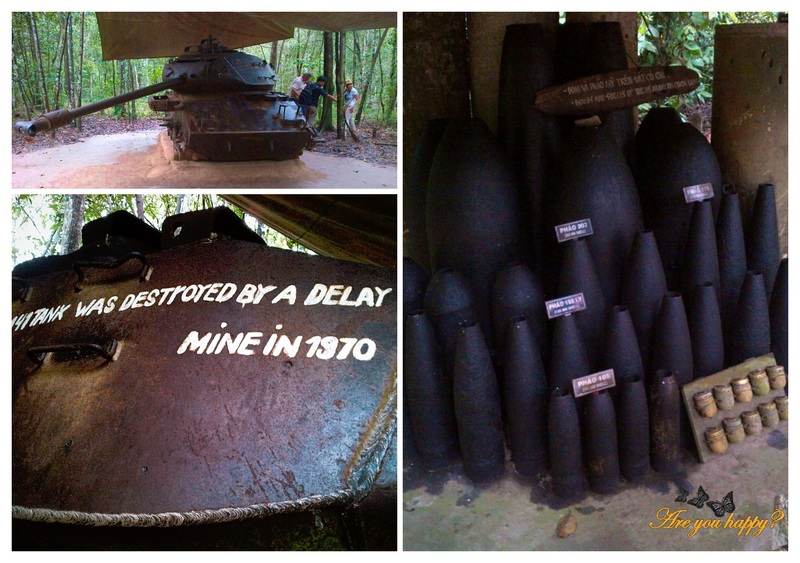 The tunnels were located some 65 km away from Ho Chi Minh City and their construction started somewhere in the late 1940s during the war against the French. The tunnels were dug by hand or with rudimentary tools and were gradually expanded by the North Vietnamese and the Viet Cong troops (supporters of the communists in South Vietnam) in the early 1960s as the United States increased their presence in Vietnam. 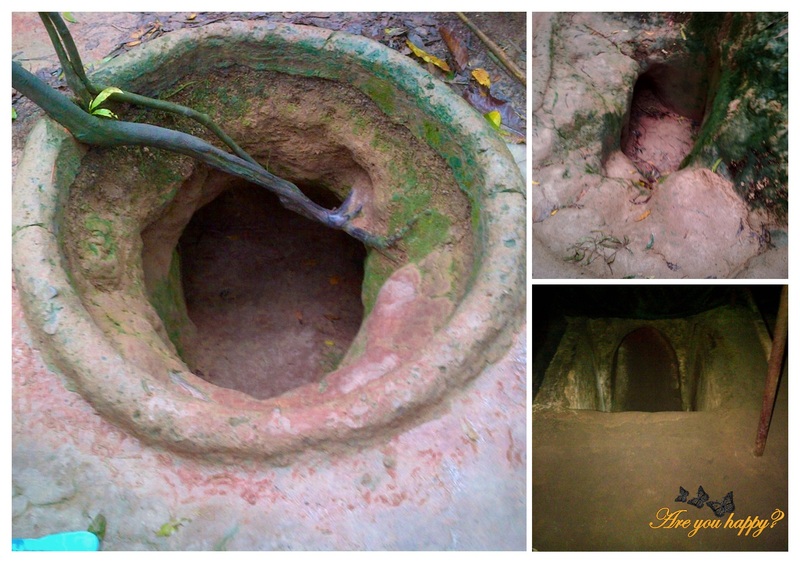 It is said that the tunnels had around 250 km running from the outskirts of Ho Chi Minh City to the Cambodian border. 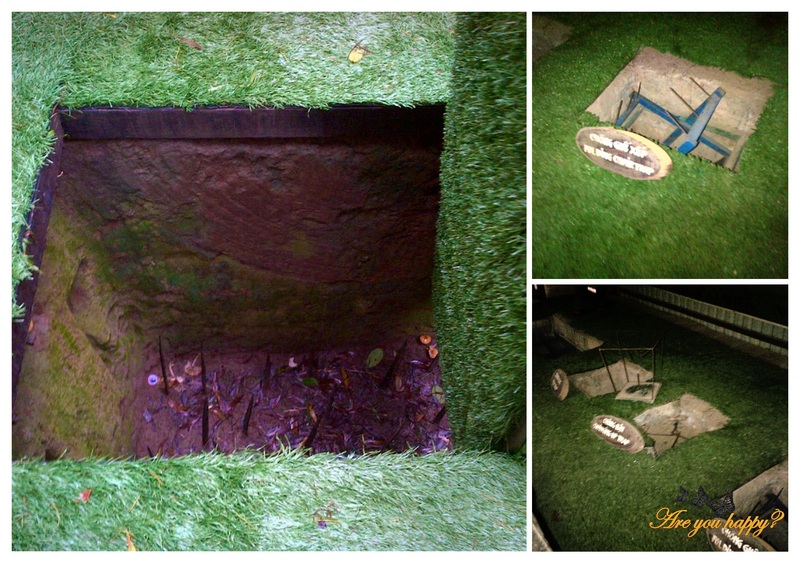 The tunnels were divided in 3 levels going up to 12 meters in the underground. Some complexes had even four different levels with secret trapdoors separating them. The different levels held headquarters, kitchens, storage areas, living areas, hospitals, meeting rooms, rooms for making weapons or traps. Hospitals were actually small spaces (the size of half a room in a flat) were wounds were treated superficially due to the lack of medicines and proper operating areas. In the sleeping areas people were usually sleeping in hammocks to avoid the humid and warm soil and the vibrations from the continuous bombing. In the kitchens meat and vegetables were cooked; most often, due to the lack of food, people in the tunnels were eating tapioca (sweet potato) which was nourishing and easy to cook. The air in the kitchen was taken out through special air tunnels meters away from the actual kitchen in order to lead the enemy away from the actual tunnel entrances. An old Vietnamese adage says: “When the enemy is at the gate, the woman goes out fighting”. 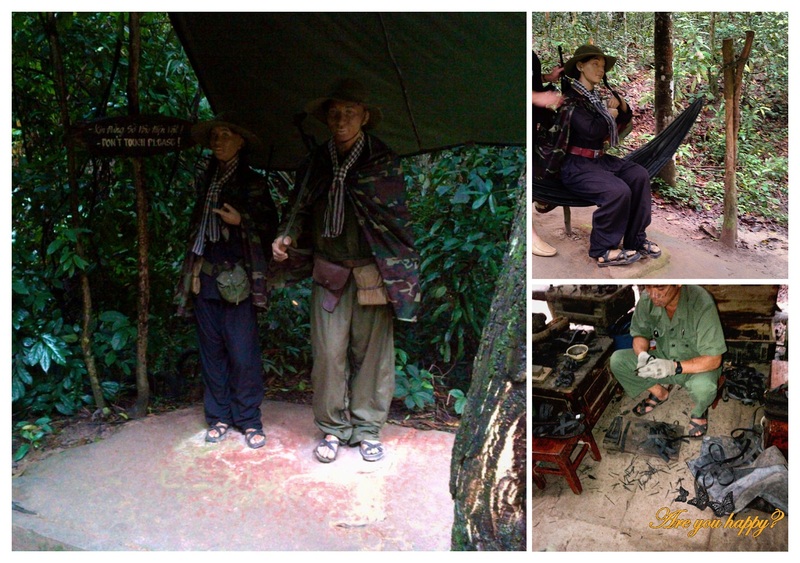 We learn from our guide that women were of crucial importance to the war. 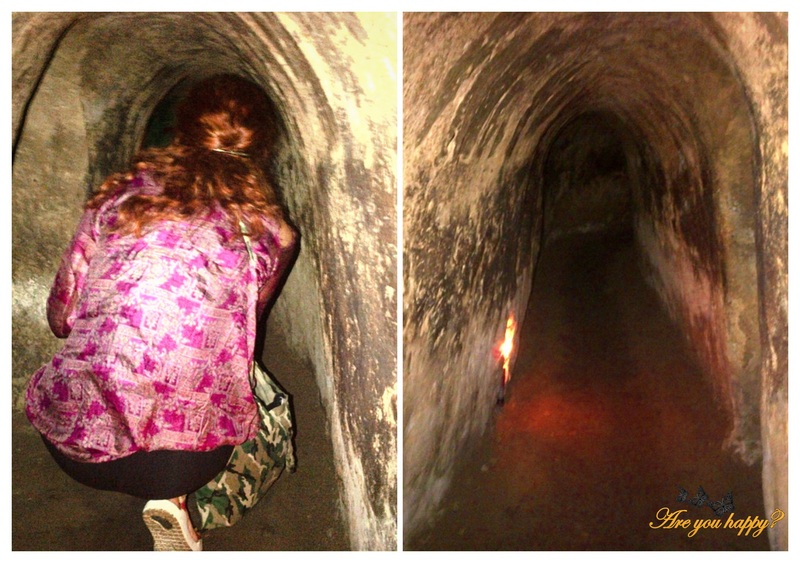 In the tunnels women were mainly in charge with cooking, preparing the maps of the tunnels and guiding the fighters. Outside the tunnels they were fighting alongside men. During the war women learned to fire weapons, lay traps, serve as village patrol guards and intelligence agents, recruit people or keep the supply lines flowing. 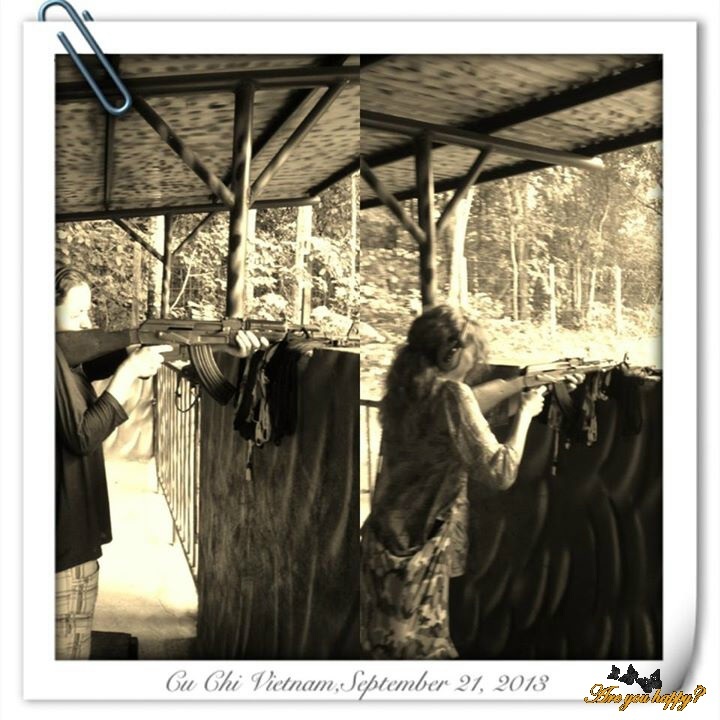 While visiting the Cu Chi Tunnels we got to go through the small entrance doors of the tunnels (spider wholes), squeezed through 20 meters of dark, humid and warm tunnel, visited hospital rooms, meetings rooms, eating areas, were presented with all kinds of traps and fired guns with live ammunition in the firing area; all this with a sound of automatic guns and bombs around. 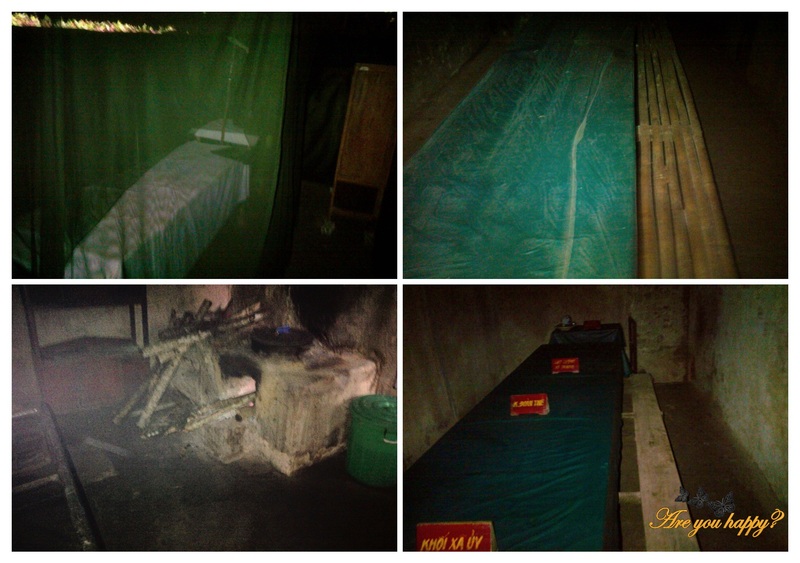 The tunnels that are part of the visit were enlarged to fit the tourist; the initially tunnels and entrance doors were smaller since the Vietnamese people could easily fit whilst the enemy could get stuck. Tunnels were so small that they only went one way; once you were in the tunnel you couldn’t go back just straight up to the next door or level. 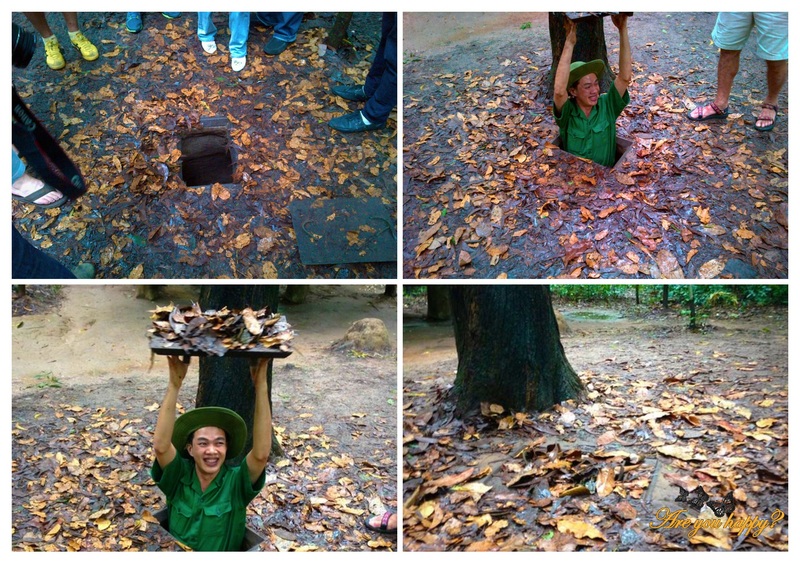 The Cu Chi tunnels did not go unnoticed by the United States. Several major campaigns were launched to search out and destroy the tunnel system of the Viet Cong including dropping bombs, flushing the entrance of the tunnels with gas, water or hot tar, tossing grenades down the holes to crimp the opening, training the so called Tunnel Rats to enter the tunnels and fight inside. Towards the end of the war the tunnels were so heavily bombed that became hard to use. But by that time they have served their purpose – that of protecting the North Vietnamese units and allowing them more time to fight, prolonging the war and increasing the American costs and casualties until their withdrawal towards 1975. It is said that around 45,000 people died defending the tunnels. As we are driving away from Cu Chi tunnels I can’t stop thinking of those times of war that we had a glimpse of and the strength a person has to have to fight a war, to protect his/her family, to survive while leaving underground for weeks or months at a time of non-stop bombing and countless deaths of close ones. Maybe it all comes down to what you believe you can do and how long you can keep the hope alive. Ho Chi Minh warned that if the Americans “want to make war for twenty years then we shall make war for twenty years. If they want to make peace, we shall make peace and invite them to afternoon tea”. Incidentally, the Vietnam War lasted for 19 years, 5 months, 4 weeks and 1 day. 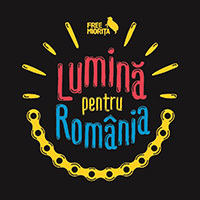 You can find here our Tips & Tricks. 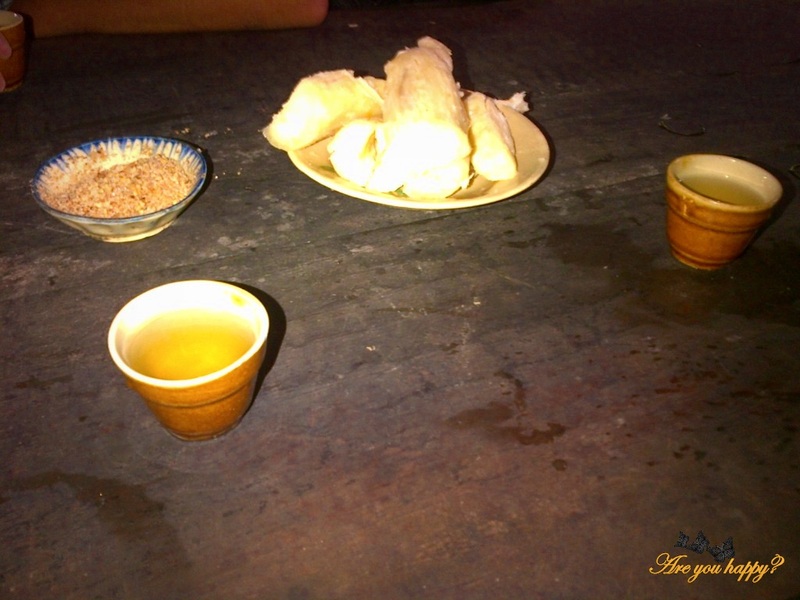 try the tapioca (sweet potato); we loved it.